Top Stamford domestic violence defense lawyers would agree that a charge of threatening in the 2nd degree can have a significant impact upon your future and serious consequences that can impact your life. Laws for domestic violence offenses have progressively become move serve as the Legislature has declared war on domestic violence also known as “family violence crimes.” When you are charged with the domestic violence crime of threatening in the 2nd degree you are caught up in the family violence court system and you need an experienced Stamford domestic violence defense attorney to find the most effective way to fight the charges against you and seek every available avenue to get the charges dismissed. When you are charged with threatening in the 2nd degree you face the potential criminal consequences which include the possibility of up to a year in jail, a hefty fine, and the possibility of probation. But in addition because the crime was also charged as a domestic violence offense you can face additional issues and problems to deal with in the nature of criminal orders of protection and restrictive conditions of release. If you have been charged with threating in the 2nd degree, protect your freedom and get informed about your rights by calling a Stamford domestic violence defense attorney today for a free initial consultation. At the Law Offices of Allan F. Friedman we have compassion for the difficult situation that you are faced with and we understand that you are undergoing a lot of frustration, stress and confusion. Our clients “come first” – we invest the time to know our clients and their cases, we fight to protect their rights and remain determined to obtain the best results possible. Reasonable rates / payment plans. Threatening in the 2nd degree is becoming a very commonly charged domestic violence offense in Connecticut. You don’t have to actually be physically present at the same location as the victim to be guilty of this crime. Furthermore, under this statute no actions or act is required, mere words spoken or sent by written form are sufficient to convey the threat and constitute a violation of this statute. More and more often we are seeing people arrested who get into text messaging arguments, get hot headed and then send threatening text messages which they had no intention of ever following through on getting arrested. In some cases people are highly intoxicated and send messages that they really had no rational intention of carrying out but wind up being arrested anyway. The best Connecticut criminal defense attorneys will agree that as technology, text messages, social media, face book, Instagram and the like have proliferated arguments between partners or parties engaged in a divorce or in the process of breaking up for example become forever fixed and preserved as evidence in written form. This phenomenon converts what used to be a “he said she said” battle of who was telling the truth into a more solid case for the State when they have the threatening words preserved in electronic form. It used to be that threats made in the heat of an argument were spoken and without a witness it was one person’s word against the others and often a tough case to prove. With the advent of social media and text messages any threat made via those channels becomes very conclusive evidence of what was said. During my 25 years of experience in the defense of threatening charges I have seen many cases where defendants were falsely accused of making threats by parties who had ulterior motives, such as to gain advantage in a high conflict divorce case or to get revenge for a perceived wrong such as when the victim is angry or jealous. However, where the threat is conveyed via digital media or text message it is often difficult to deny that the message was indeed conveyed. In these situations we need to examine alternative defense strategies to resolve the case favorably. If you have been arrested for sending threatening texts or written communications contact our offices today to schedule a free consultation to review the facts of your case and start to develop a plan for your defense. All criminal statutes require the proof of various elements to establish a conviction. One of the most important elements of any criminal statute is the requisite mental element or state of mind required when committing the crime. The crime of threatening in the 2nd degree requires among the highest levels of mental intent. Due to the protections provided under the First Amendment of the United States Constitution which protects freedom of speech, when the threatening in the 2nd degree statue was drafted the Legislature had to include the language that a specific intent or reckless disregard to cause fear or terror is required to constitute a crime. In other words the State has the tough burden to prove that not only did you say some violent words but that you had the mental intent to place the victim in fear or terrorize the victim in speaking these words (or texting). This means that if you were only joking around, playing games or just teasing for example your words no matter how violent would not constitute a criminal act. I wanted to highlight this aspect of the statute to demonstrate that there are some strong defense strategies available to defend these type of charges. However, keep in mind when investigating these type of offenses the Police are usually going to err on the side of caution and make an arrest when there is threatening language and a complaining victim. They will leave it to the Courts to sort out if the Defendant’s Constitutional rights have been violated and if the threatening remarks were only make in jest or if they were rather intended to strike fear into the heart of the victim. Thus a violent threat you convey may result in your arrest and then having to wind up defending yourself later that it was only a joke and that you did not intend to scare or place anyone in fear. It should be noted that under Connecticut law when the victim makes a complaint of domestic violence threatening the Police are required to investigate the allegation if they find probable cause to support the allegation that a crime has occurred. Once the police have begun the arrest process it is no longer up to the victim whether or not to proceed with the prosecution. If the victim later wants to “drop” the charges the Police are required to go forward with an arrest which is usually processed through an arrest warrant application in these type of cases. This is known as our “mandatory arrest law” which applies in domestic violence cases. In the case of threatening in most cases the victim will contact the Police to make a complaint and the Police will begin an investigation. In most cases they will contact you to get your side of the story. However, it is best to remain silent and not say anything. If you are contacted by the Police tell them you wish to have a lawyer present for questioning and ask them for their contact information and tell them you will get back to them after you have had a chance to speak with a Stamford domestic violence defense attorney. Never go into the Police station without a lawyer and discuss your case, answer questions or make any statements about your case. In many electronic or texting threatening in the 2nd degree cases the Police need to apply for search warrants to seek proof that the source of the message was indeed you. This often takes a significant amount of time. It is best to not cooperate with any Police investigation and make admissions that you did in fact send the messages or communications as that just makes the Police’s job easier to prove their case. You have the right to remain silent and not answer any questions and you should always exercise that right unless your Stamford domestic violence crimes attorney advises you otherwise. Once the police have completed their investigation and have enough evidence to apply for an arrest warrant they will present the case to a Judge who will review the warrant and either sign it or reject it. If the Judge signs the warrant then the Police will contact you to effectuate an arrest for the charge of threatening in the 2nd degree. In these cases you will typically be arraigned on the next business day which is a mandatory Court appearance. If you have been arrested for threatening you should call a top Stamford domestic violence attorney to minimize the consequences and guide you through the process and work to try and get the charges dismissed. While the threating words that you are accused of sending or speaking may seem very trivial and even though no one may have been injured do not make the mistake of thinking that this is not a very serious allegation that has some major consequences that if you are convicted of threating in the 2nd degree. If you were convicted for threating in the 2nd degree you would have a criminal record, you would then be ineligible for most diversionary programs, and you could face up to a year in jail and probation, fines and the conviction would have a major impact upon your ability to secure future employment. If you have been arrested for threatening in the 2nd degree you should seek the legal counsel of a Stamford threatening defense attorney at the Law Offices of Allan F. Friedman who will fight to defend your liberty and seek to have the charges dismissed altogether. Defending Domestic Violence Threatening in the 2nd Degree Charges What Is a Domestic Violence Crime? If the connection between the Defendant and the victim falls within one of these categories then any crimes of violence that take place between you would be classified as a domestic violence crime. While there is no such thing as a “domestic violence” crime per se, rather what happens is what ever violent crime that you have been alleged to have committed between individuals that fall within the list set forth above would then be treated as a “domestic violence” crime by the Court because of the relationship between the Defendant and the victim. These crimes are them placed on the “domestic violence docket” and are then subjected to the additional procedural safeguards applied to domestic violence cases. Thus, to summarize, if you assault a stranger your case would move quicker and with less formalities and problems than if you were to commit the same exact assault upon a family member in which case the case would be classified as a domestic crime and you would be subject to criminal orders of protection and conditions of release which would not apply with the same crime committed against a non family member. The point I am trying to make is that when a crime is designated as a domestic violence offence the resolution of that case will become more complicated and it will take more time to conclude the case. In most situations the same offense when classified as a domestic violence case will carry more serious consequences. So, if you have been arrested for threatening in the 2nd degree you should contact an experienced Stamford domestic violence defense attorney at the Law Offices of Allan F. Friedman today. If you are arrested for the charge of threatening in the 2nd degree either by an arrest by the Police or by an arrest warrant you will required to appear in Court the next business day following your arrest. 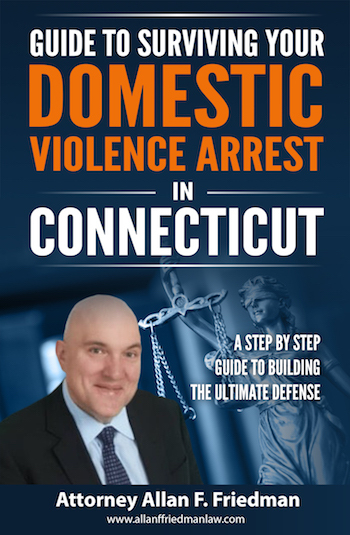 In a perfect work, everyone would have a Connecticut domestic violence defense attorney to represent then during the critical first Court appearance. On your first Court hearing, the Court will enter orders on significant matters such as criminal protective orders, and any conditions of release which the Court may impose. These orders will have a profound impact upon your life while your case is pending which could take up to several months in some cases. It is always a good idea to retain a Stamford domestic violence defense attorney to represent your interests and defend your rights during a domestic violence arraignment to fight for least restrictive conditions of release and oppose any orders of protection. Upon your arrival at the Court your first step is an interview with a family relations officer. During this interview, everything you say can, and will, be used against you. The best practice is to not discuss any details of the crime itself. The ideal plan would be to have a Stamford domestic violence defense lawyer with you during your interview to defend and advise you. The Family Relations Officer’s job is to review all the evidence and make recommendations to the Court about what kind of protective orders and conditions of release are needed. In practice, the recommendations of the Family Relations Officer are adopted by the Court in 99% of domestic violence cases. The office of family relations will often recommend as part of its mandate to encourage therapy and treatment as a method to lower rates of recidivism that the Court impose some conditions of release on the Defendant to attend some therapy or counseling sessions. In many cases these State provided programs which are offered free of charge are a huge benefit for indigent clients of those between jobs. However, for clients with a full time job or two jobs having to attend these kind of therapy sessions bi-weekly for 12 weeks often during the middle of the day can impose a significant hardship. In a lot of cases we have to file motions to release our clients from having to participate in these programs and in lieu of them engage in private therapy which is much more flexible in terms of accommodating a busy work schedule. In the case of a threatening in the 2nd degree charge the Court is going to impose some level of criminal protective order to protect the victim while the case is pending. These orders come in three different varieties depending on the nature of the allegations against you and the relationship between the parties The least restrictive order is a so called partial order which requires you to not harass, assault or annoy the other party. The mid level order is referred to as a full order which can be also called a residential “stay away” order which permits you to have some contact to arrange visitation for example but which prevents you from entering the victim’s residence. The most extreme order is known as the full no contact which means that you can have no communication of any kind or manner what so ever with the victim. It is important to understand that violating one of these orders is a very serious felony which will result in very serious consequences. If you need to modify the order you must first contact a Stamford domestic violence crimes defense attorney to file the appropriate documentation to seek a modification to modify these orders otherwise they will remain in effect until the conclusion of your case. You must not violate the conditions of these orders for any reason. Even though it is highly recommended that you have an attorney to represent you during your arraignment for the charge of threatening in the 2nd degree the reality is that due to the short notice between the time of the arrest and the arraignment the next morning most clients do not have time to hire an attorney. If you already had your arraignment and criminal protective orders have already issued against you it is not too late to hire a Stamford domestic violence crimes defense lawyer and file to modify the protective order and your conditions of release. Feel free to Contact the Law Offices of Allan F. Friedman today for a free consultation and learn about how we can defend you against the charge of threatening in the 2nd degree and get the charge dismissed or reduced and resolve your entire case. All of the top Stamford criminal defense lawyers will agree that a domestic violence threatening in the 2nd degree charge is a charge that has many paths towards a successful resolution. After 25 years of defending these charges our goal is always to seek a dismissal that will leave you without a criminal record. Putting together an effective defense starts with an extensive intake interview with you, the client to hear your side of the story and learn all the facts and get to know you. From there we will examine carefully the Police report and the allegations of the victim with an eye towards finding factual inconsistencies and any potential violations of your Constitutional rights. If needed we will investigate the victim if there are any facts which support a claim that the allegations against you may be false. Armed with all of this information, we will consult with you to develop the best possible defense strategy possible with the ultimate objective to have the charges against you dismissed. Your best option is to select an attorney with a lot of experience working on domestic violence matters as these cases employ many tactics and methods that are unique to this area of criminal defense. If the threat is a minor one and the victim is not overly agitated then perhaps taking a course of anger management therapy through a Court ordered provider or a private therapist will be sufficient to obtain a dismissal of the charges. Many threatening in the 2nd degree domestic violence cases can be successfully resolved through negotiation with the state and family relations. In cases where the threats made were severe, or when the victim is very opposed to the State dropping the charges, there are other options available which will result in a dismissal. The Family Violence Education Program is a diversionary program, and if you successfully complete the terms of the program would it would result in a dismissal of the charges and you would have no criminal record. Finally, as mentioned above in tough cases where there are severe allegations we are not afraid to stand up against the State and take your case to trial where appropriate. As I have mentioned in threatening cases the State has a high burden of proof to establish that your speech or communication was made with a specific intent to terrorize or place the victim in fear of imminent physical harm. The First Amendment protects many forms of speech. There are many defenses to a threatening case which may apply to your particular situation and which we can discuss at length during an office consultation. No matter what the charges I will fight and try to explore every option to have your case dismissed before applying to use a diversionary program. If you have been charged with threatening in the 2nd degree your first step should be to come see us for a free consultation to review the facts of your case. During your free consultation we will review all the possible defense strategies and consider every option to try to have your charges dismissed or reduced. Let Us Fight Your Domestic Violence Threatening in the 2nd Degree Charge! We offer you a free initial consultation. We have 25 years experience defending threatening charges throughout the State of Connecticut. During our first meeting we will review your goals of the representation which are usually a dismissal or a reduction of the charges and go over any special concerns that you may have. Hiring an experienced Stamford domestic violence attorney can make the difference in having your case dismissed or reduced down to a lesser charge. If you been arrested for threatening in the 2nd degree charge in Greenwich, Stamford, Norwalk, Darien, New Canaan, Cos Cob, Fairfield, Westport, Wilton, Weston, Bridgeport and throughout the County of Fairfield do not hesitate to contact the Law Offices of Allan F. Friedman. We work on a flat fee basis and our rates are reasonable. We offer payments plans as needed. Call Attorney Friedman at 203.515.4110 to schedule your free initial consultation we are available 24/7. Or you can contact us online for a prompt response.